No rants, no ramblings, and none of my usual long posts today. All I want to share today is a quick recipe I created over the weekend. Before I do that there is one more thing I want to mention quickly. It’s regarding RCI round-up. My initial plan was to post the round-up in first week of August. But due to heavy workload and some personal workload I haven’t had any time to sit and work on it. So my sincere apologies for the delay and I am hoping to post the round up in a week or two. Please bear with me this time! With over 80 entries, this edition of RCI-Udupi & Mangalore is going to be one bumper bonanza and I want to do full justice to it. And now coming back to today’s recipe of Aloo Lobia, this recipe is something I came up during one busy weekend (yeah, even weekends are busy these days). I wanted to cook something good and comfort food as I was craving for some carbs by the end of the day after working non-stop. At that same time I didn’t want to spend more than 5 mins in front of a stove. One quick thinking and pairing black eyed peas and potato seemed like a good combination. And voila, it was better than good! An aromatic Tadka of cumin and curry leaves followed by cooking sweet onions and then a can of chopped tomatoes didn’t take more than few mins. By the time the ground spices were added and cooked along tomatoes, I was ready with cubed potatoes and rinsed black eyed peas. I literally dumped everything in a pressure cooker and left it cook on medium flame. While I stretched my feet with my favourite novel, the aroma of Aloo Lobia curry tickled my nose and then my stomach was giving all the signals for a delicious meal to look forward to. And it indeed turned out to be one delicious meal where I enjoyed this creamy Aloo Lobia with frozen chapattis and Krish enjoyed with Jeera Rice. Heat oil in a pressure cooker and add cumin seeds. When cumin starts to sizzle and turn golden red, add hing and curry leaves. Sauté it for few seconds. Add finely chopped onions and cook till they turn translucent, about 2 minutes. Add ginger-garlic paste and green chillies and fry for a minute. Mix in chopped tomatoes or canned tomatoes and cook till they are pulpy and release their juice, about 3 minutes. Add all the spice powders (sambar/rasam powder, coriander and cumin powder and turmeric powder) along with tamarind paste, jaggery and salt to taste and mix well. Cook on medium heat for a minute. Now add 3-4 cups of boiling water and bring the whole mixture to gentle boil, about 3 minutes. Mix in cubed potatoes and soaked black eyed peas and cover the lid. Place the weight on lid and cook for 2-3 whistles or 12-15 minutes on medium flame. Let the pressure be released completely before opening the lid. 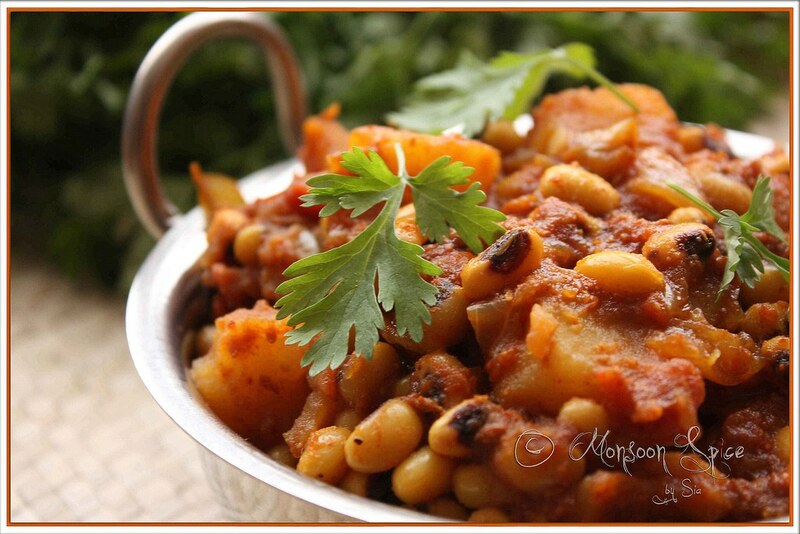 Serve this delicious Aloo Lobia with any Indian flat bread or flavoured/steam cooked rice and enjoy! Looks very creamy and appetizing. And very easy to put together. Sia, this dish sounds like a winner for me. Thanks for sharing! Wow,mouthwatering.I would prefer both chappathis and jeera rice with this or just this itself.Love the new blog look Sia,I missed coming here. Aloo lobia looks spicy and so delicious beautiful pic. This one looks so spicy and yummy. I am not much of a fan of black eyed peas, but I prepare something similar to this at home with chick peas, though the quantity of chickpeas remain more than that of potatoes. I loved your images, how did you create that style on the first image? 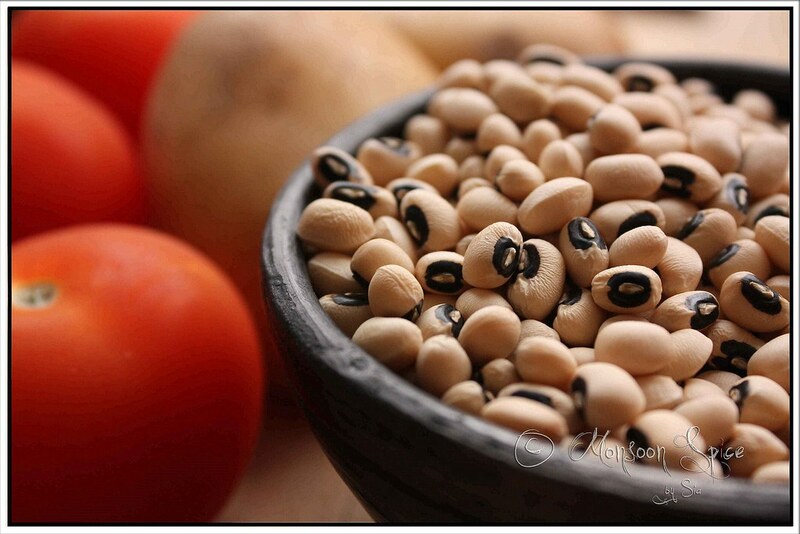 Black Eyed Peas - Is it known as ALASANDE BEEJA in kannada (Mangalore Side)? I'm not quite sure. That's the reason I ask. And I love alasande beeja. This preparation looks good & takes me back to my dodamma's place in Puttur. First time here....You have a nice blog out there and great clicks! love lobiya. never tried it with aloo, but will do now. hope ure doing well. Looks very appetizing. As usual. OMG! Bookmarked to be made soon! I made it yesterday to take to a get-together with some friends who are vegetarians and they LOVED IT as much I did! :) Thanks for a great recipe! @Cynth, Glad to know that ur friends enjoyed it darling :) Hw have u been? I love cowpeas too...they are tasty and healthy. Your version looks interesting. Oh very nice recipe and it looks mouth-drooling!!! Looks very creamy and delicious Sia... Never tried the blackeyed peas.. Bookmarked it! Its been a while since I was last here (or anywhere else) and for a minute I thought I'd landed somewhere else! Hey! First time on your blog. You have amazing blog and recipes. 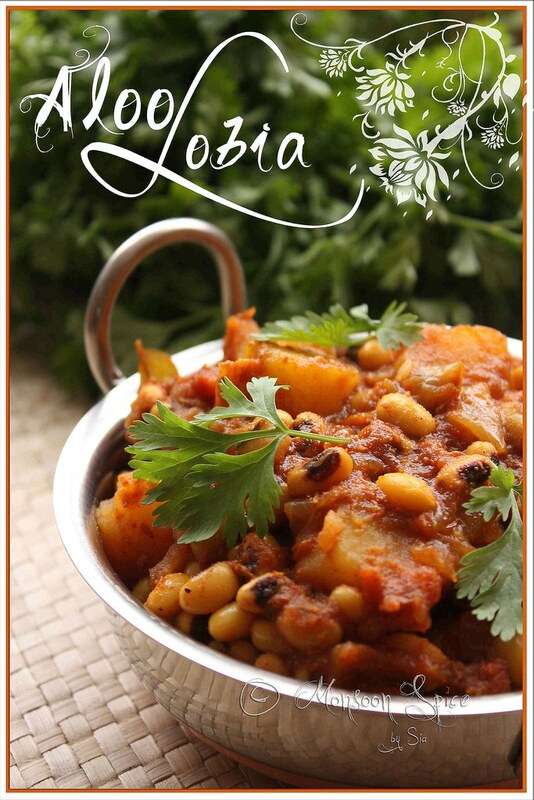 I just loved the lobia curry. I am new visitor to your blog.The curry looks so yummy..will cook on friday night..
looks so nice. I will try this on Friday night. Have all the ingredients at home so might give it a try tonight, its so cold here in the UK at the moment and this looks so warming, thanks.